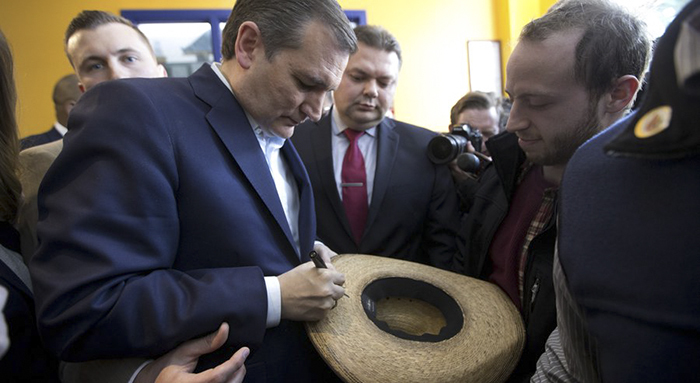 Republican presidential candidate, Sen. Ted Cruz, R-Texas autographs a hat for a voter at the Sabrosura 2 restaurant in the Bronx borough of New York, Wednesday, April 6, 2016. Democrat Hillary Clinton, meanwhile, embraced a tougher approach with liberal rival Bernie Sanders, who beat her in Wisconsin. Still, Sanders’ string of recent primary victories has done little to erode the former secretary of state’s overwhelming delegate lead as the 2016 primary season lurches toward a high-stakes contest in two weeks in New York. As the Democratic front-runner tried to undercut Sanders’ recent momentum, Trump’s grasp on his party’s presidential nomination appeared far more tenuous. Senior Trump adviser Barry Bennett shrugged off the Wisconsin loss to Texas Sen. Ted Cruz, but he also said the billionaire businessman would soon begin to deliver a series of “presidential, substantive” speeches on his policy priorities. That list likely includes immigration, trade, defense and taxes. At the same time, Trump’s team quietly worked to resolve problems with its young delegate outreach operation, a critical tool as the primary campaign speeds toward the possibility of a contest convention. The tension centers on campaign manager Corey Lewandowski, whose management style has alienated some would-be allies on the ground in key states. For example, the campaign over the weekend fired the person running its Colorado operation ahead of the state’s convention on Saturday. The move was confirmed by a person with direct knowledge of the staffing situation who spoke on the condition of anonymity to discuss internal deliberations.